…unless they play like they did against Illinois. Or Minnesota. Or any other non-Ohio State Big Ten team. How many times have you thought Purdue was going to compete this year and instead just completely laid an egg? It could happen again. This isn’t yours or your parents’ or your grandparents’ or your great-grandparents’ Indiana team. They’re actually decent. And with no bowl to play for (just like so many years in the past), this IS their bowl game. 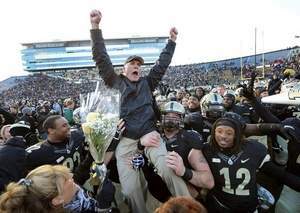 Nothing would make the Hoosiers happier than to keep Purdue out of a bowl game. Their two Big Ten wins have come against Iowa and Illinois. Sound familiar? Indiana believes this is an even game and might just pull it off. This week, we’re betting any value up to the cost of the most expensive sporting ticket we’ve ever purchased. If Purdue makes a bowl game, we have to double whatever we bet for this game. The spread is Purdue -5.5. Since I’m so far behind, I’ll be betting the entirety of my $220 2007 NBA Finals Game 3 ticket between the Cavs and the Spurs. The Cavs lost, but there was no way I was missing the first NBA Finals game in Cleveland history! Kirk will be betting $100 of his $200 Final Four ticket from 2010. I went with Kirk to this one - it was worth every penny! Happy Thanksgiving everyone! Why are you reading this instead of watching football, drinking beer, eating pumpkin pie and hanging out with your family? Why am I writing this instead of watching football, drinking beer, eating pumpkin pie and hanging out with my family? It's going to be a short one. The Boilers survived a scare in this one as they took only a one point lead with a Terone Johnson 3-pointer to end the first half. 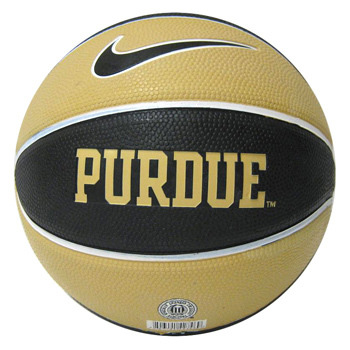 However, Matt Painter put a charge in his troops as Purdue held the Seahawks to 12 second half points for the much needed win. With toss-up games against Clemson and Xavier coming up in the next week, it was vital to remember how to win again. Solid second-half efforts are becoming the trend for this team, however this time, it wasn't close enough to blow it at the end. Terone Johnson led the team with 19 points and it's great to see him finally healthy. Also among the highlights is Jacob Lawson play, as he put in 17 energetic minutes and seemed like he was everywhere with 2 monster blocks. You don't often see someone who scored zero points be among the highlights, but Lawson is really endearing himself to the Purdue faithful. But the best highlight of all was 20-24 from the free throw line! Maybe they shot better because it was an inferior team and there was less pressure, but it's great to see these guys convert at the line. Imagine what the first half score would have been if they didn't shoot 8 for 9 from the stripe! As I mentioned, this was a quick one due to the holiday. The only other thing I'd like to point out is Kirk's unbelievable streak of picking 7 consecutive games wrong against the spread. That is something that's in the 99th percentile of improbability....let's see how long this streak continues and hope he keeps picking against Purdue! After an absolute disaster in New York in the 2K Sports Classic, the Boilers return to Mackey Arena to hopefully beat up on the UNC Wilmington Seahawks. It's very clear this team needs a lot of work, and while there's still potential for the players to develop and better gel as a team, if they don't figure things out quickly, conference play will be here before they're ready. Wednesday's game should be a chance to work on things like actually running the offense, stopping the turnovers, and watching the fouls, though we know the free throw woes are going to last all season. Also, it would be nice to see DJ Byrd and the Johnsons start hitting their outside shots at a higher percentage, and they should have the opportunity since UNCW will likely have to pack the paint to try and stop the Boiler Bigs and slashers. Why Purdue Will Win - UNCW is a bad team. Even with the Boilers' struggles, there's no excuse for this game being remotely close. Wilmington has lost by 43 points to Richmond and 38 points to Ohio, both on the road. They are turnover prone and shoot poorly, which sounds a lot like the Boilers, however, the talent gap is quite large and the Seahawks are a bit undersized (and guard heavy with their rotation). Purdue should win the rebound battle and be able to score inside, as long as they figure out how to actually run their offense. Think AJ Hammons will drop another 20 points? Definitely possible, but I expect the rotation to still be deep with lots of players getting minutes against a weaker opponent. 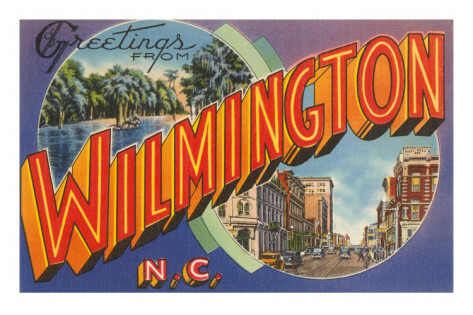 Why UNC Wilmington Will Win - In a previous game this season, the Seahawks went 19 for 19 from the free throw line. 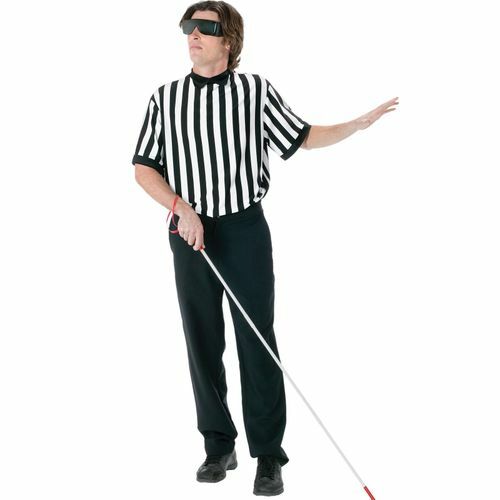 Maybe the Boilers can learn something from them this time, but we all know the refs can sometimes get carried away with one-sided whistles. If UNCW can protect the ball and get Purdue in foul trouble, they have a shot of making this a closer game. Still, to have a chance to win, they'll need to also get hot shooting despite hitting less than 38% of their shots this season, and don't expect it to be from downtown as they're just as bad as Purdue in that regard (26% and 25% respectively). One thing you absolutely need to know before the game - Hopefully the game isn't even remotely close, since anything else would be quite disappointing. If you're in the Greater Lafayette area, take a kid to the game. Tickets for kids 14 and under are only five bucks (with the purchase of an adult ticket). With the students on Thanksgiving break, Mackey will probably be pretty quiet missing the Paint Crew, so take some loud and rowdy kids to scream and shout for the Boilers. Our Picks - We like to think we're better than Vegas. So throughout the season, we'll be "betting" a whole dollar amount versus the spread between $1 and $32, but we can't repeat the same value twice. The spread for this game is Purdue by 20.5 points. Last week's game against Iowa was a fun one. This week's game was not. 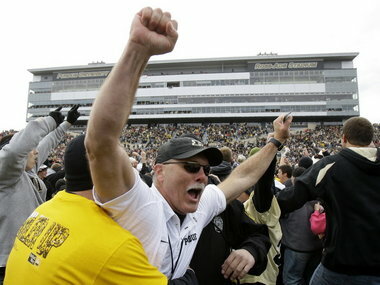 But after a couple tough basketball losses, a 20-17 win was all Purdue fans were looking for. 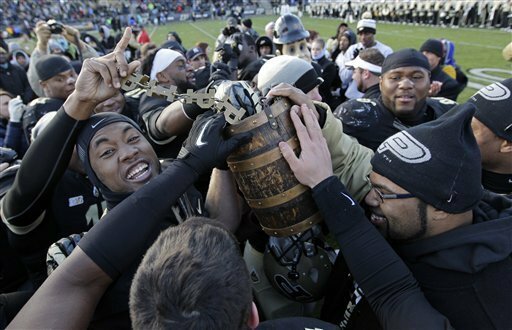 Amazingly, a win at home against IU most likely puts Purdue in a New Years Day bowl game - perhaps against a team who just beat the number 1 team in the country! Regardless of how you feel about Hope, I think we can all agree it would be pretty nice to wake up on January 1st to get ready for a bowl game against a BCS conference opponent. "Maybe if we jump up and spread our bodies out it'll look like there are more than 50 people here!" The Boilers lost the turnover battle against Iowa 3-0, yet still pulled out the win on the road. So, one would think that WINNING the turnover battle 3-0 would result in a cakewalk for Purdue. The Illini fumbled the ball three times in the first half, yet Purdue gained a total of -11 yards off of those three turnovers. I'm sure I wasn't the only one who felt the Boilers were in trouble at this point. I don't even want to think what would have happened had we turned the ball over. Losing that game might have been the low point in Danny Hope's career. Marve played a very efficient game (18-26 for 173 yards - even with a 63-yard TD pass) and special teams didn't make a single boneheaded mistake. It may not have been a pretty game, but the Boilers didn't do anything to lose it. Ralph Bolden's 63-yard run was one of the best runs I've seen all year and should have resulted in a touchdown. Unfortunately, Bolden suffered a pulled hamstring 15-yards into his run, yet he STILL scampered another 40-yards on a bum leg! Purdue ended up scoring a big touchdown on the drive a few plays later. Bolden is questionable for his last game at Ross-Ade this Saturday - let's hope he can play so we can celebrate his great career at Purdue. It's a quick turnaround for Purdue as they got their hearts ripped out last night. However, that doesn't mean tonight's game is any less important. You can't call a game in mid-November a must-win, but this is as close as you can come. Starting the season 1-3 with 3 losses against potential bubble teams would definitely hurt come March. Why Purdue Will Win - Purdue has more talent than Oregon State, but can they finally get over the hump in a close game? After losing two close ones, the Boilers need to come out angry on defense and force Oregon State into numerous turnovers. 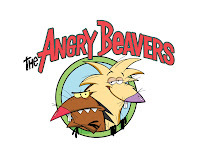 The Beavers committed 19 turnovers last night and still almost knocked off Alabama. If Purdue forces 20, they'll win. Why Oregon State Will Win - This Oregon State team is better than a lot of Beaver teams in the past. They have experience and an explosive scorer in Ahmad Starks. Also, Devon Collier - a starter last year - scored 21 points off the bench last night and nearly willed the Beavers to a come back win against Alabama. The Beavers have more size than Villanova, so expect the Boilers to have less success on the boards as well. Finally, Angus Brandt is their senior 6-10 center from Australia. No, he's not 300 pounds like you'd expect from someone named Angus, but he's nearly averaging a double-double in his first three games. If Oregon State controls the glass and can play an offensively efficient game, the Beavers should pull this one out. One thing you absolutely need to know before the game - Despite nearly every pregame source stating this game is on ESPNU, I'm pretty sure this game is on ESPN2. My online guide doesn't say, however according to the official ESPN TV listings, the game has been changed to ESPN2. I wouldn't put my life savings on it (or even $32), but with many people recording a 5:00 pm game, I HIGHLY suggest recording both channels if possible. Many providers now offer online DVR access, so logon and set that DVR! Our Picks - We like to think we're better than Vegas. So throughout the season, we'll be "betting" a whole dollar amount versus the spread between $1 and $32, but we can't repeat the same value twice. The spread for this game is Purdue by 1. It's the morning after and I still feel sore from the gut-punch that hit me last night. Kirk was at the game and might do a special one-off post at some point, so I'm going to keep this one brief. 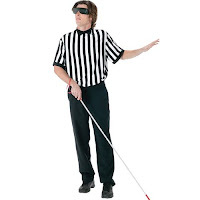 Look, bad calls happen. They happen all the time. Some are bigger than others and in the end they usually even out. But what happened yesterday was just atrocious. It was a collective "F-U, WE'RE GOING TO DECIDE THIS GAME" from the refs in an otherwise fun and exciting game - one where the Boilers showed a ton of heart and resiliency in coming back from a big deficit. While the flagrant-1 on DJ Byrd got all the press, the officiating in the first half was simply horrible. And while most of the second half could at least been labelled as "even", it all went downhill in the last minute of regulation. And the Oscar goes to...Darrun Hilliard! - Jay Wright (Villanova's head coach) said he didn't see it and that he doesn't like the rule. - Len Elmore (a pretty well-respected announcer) said "I STRONGLY disagree with that call" about a dozen times. - James Bell (the guy who was 1-8 from 3-point range in regulation that all the sudden went off with two huge overtime 3's) mentioned, "I didn't see it, but I have to think the officials made the right call." It was a flop. Plain and simple. Did Byrd touch him? Possibly. It's tough to tell, but if he did touch him, he grazed Hilliard's chin with his tricep. Hilliard's head instinctively jerked back to avoid the contact. Then, when seen on slow motion, his head actually moved forward again. At that point he realized that he could draw a foul and fell to the floor. I doubt that he was even thinking flagrant-1 while he was on the floor...he was just excited that he had drawn the foul. If you get hit in the head hard enough to fall down, your head doesn't jerk back into place after the initial contact...it immediately goes back and takes the body with it. So was it a foul? If he grazed his chin, then technically, yes. 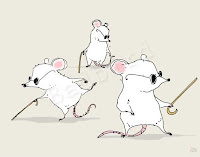 But Brian O'Connell, Bo Boroski, and Bert Smith made a mockery of the replay. And that's why instead of feeling the joy of a great win today, it has been replaced with shock, disbelief, and a feeling that this is going to haunt us come March. - DJ Byrd played a roller-coaster of a game. He really struggled in the first half and shot an airball on a forced three ball when Purdue was down 9 in the second. Maybe it was Painter's ranting over that shot, but something clicked. Byrd made two fantastic feeds inside and hit a huge three, erasing the 9 point deficit almost immediately. And just when it seemed like Villanova had taken control again, Byrd led another big run to put the Boilers up for (almost) the rest of regulation. That's what we like to see, DJ! - Free throw shooting was once again horrendous. 16-28 (57%) is not going to cut it, especially when the Wildcats shoot 33-41 (81%). But boy was Villanova streaky from the line. They started 12-14, then missed 5 consecutive free throws (including the front end of 2 one and ones) right when the Boilers made their run. They then made 21 of their next 22 free throws. Folks, that's how you win a game. - I don't even want to put this point down, because the final possession in regulation (a forced air ball by Ronnie Johnson as the shot clock expired) was so miserable. Why we were running down the clock in a tie game where Villanova was guaranteed to get the ball back was just mind-boggling. Prior to that, however, the Boilers did something that I haven't seen from them in a long time. They created shots with the lead in the last 3 minutes! They didn't hold the ball! Ronnie Johnson created and drained a wide open 15-footer with 15 seconds left in the shot clock and just under 3:00 to go. Then, with 1:30 left, Terone Johnson found a wide-open DJ Byrd under the basket for an uncontested layup. I don't remember the last time Purdue attacked late in the game with the lead, but let's hope the trend continues. - Loved seeing the "Purdue" band consisting of a bunch of 15-year-olds playing what I think was "Hot Cross Buns". They were young, probably didn't know where Purdue was located, and were much more "diverse" than what you'd expect from a Midwestern school in the middle of corn fields. But hey, they got a free t-shirt and cheered for Purdue, so thanks for representing! Now bring "home" a win tonight - we really need it! 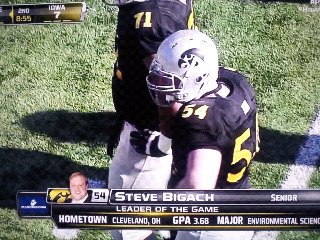 Screenshot of the week: Loyal readers may remember the Purdue-Iowa preview in which Steve Bigach was featured as the Player we're most concerned about since their stock photo may break our TV. Well sure enough, my TV has not been the same since Bigach was named the Marine Corps' Leader of The Game. 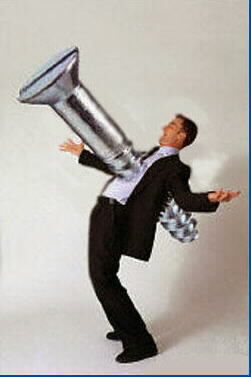 Check out the ugly stock photo in the screenshot of the week! Thing I learned from BTN: Nothing. 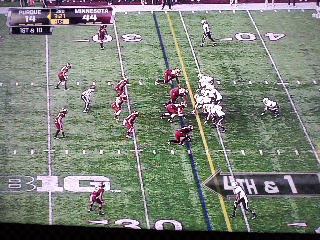 Now, I don't normally learn much from BTN, but did anyone actually stay home and watch the game live? It was 70 degrees outside (plus nobody wanted to sit through 3 1/2 hours of another potential blowout), so I, along with Boiler Nation, watched the game on DVR. And boy was it glorious! No horrible announcing. No watching highlights of a no-hitter that BTN was lucky enough to televise every single commercial break. No J Leman. And a Purdue win. What a great Saturday! 4) They said things like "I've got Johnson's on my brain!". Comment of the Week - Wife Edition: "Maybe he should have been the kicker all along!" 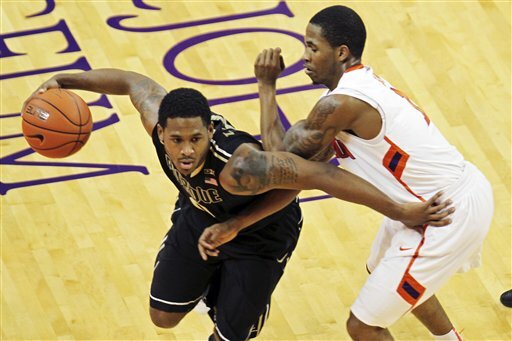 With two games left to play, Purdue heads to Illinois on Saturday to face the dreadful Illini. A loss to Illinois would be devastating: not only would it rule out a bowl game, but Purdue would officially take over the title as worst team in the conference. Illinois is simply a bad team, and there is no excuse to lose to them. Didn't you just read that above? Illinois is horrible with both an inept offense and defense. Purdue has more talent (although that hasn't resulted in many wins this year), and *shudder* maybe even better coaches right now. The players apparently love Hope, and a lose this week would let him down in the worst way possible as he'd likely be fired immediately (instead of getting fired after the Bucket game, win or lose). 2. Purdue turns the ball over and makes stupid mistakes. 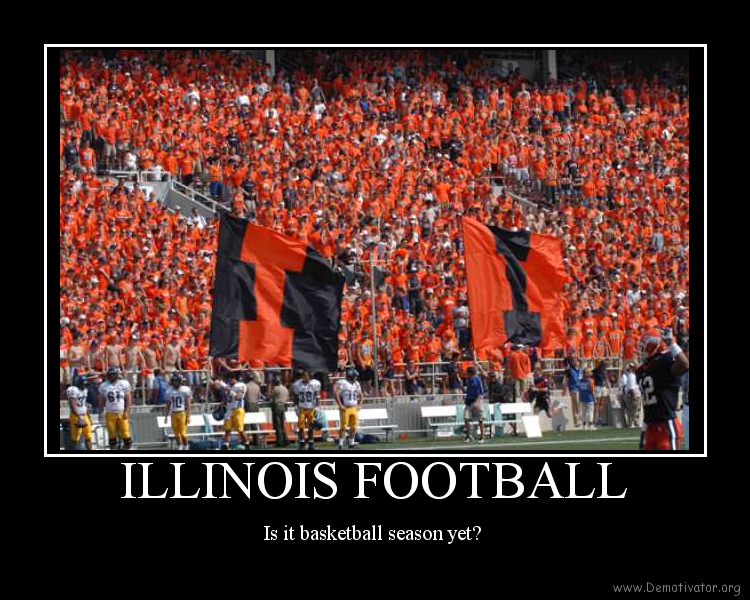 If the Illini can force some picks or fumbles to give their offense great field position, maybe they have a shot. Purdue may be in for trouble, because the Illini have Bain...Robbie Bain. Also, can we just bask in the glory that is DeJazz Woods. I want to meet that guy's parents. My last do-it-yourself repair involved fixing the electricity to the two outlets in the garage. After trying every fuse in the basement, I figured something was wrong since we still didn't have electricity in the garage. Fast-forward to a few days later. With an electrician scheduled to come over the next day for what I’m sure was at least a $100 call, I was taking a whiz in the bathroom that shares a wall with the garage. During this whiz, I noticed an electrical socket in the bathroom that had one of those reset buttons on it. Realizing that this could be the answer and REALLY excited, I forgot what I was doing and ran over to hit the reset button mid-stream. Sure enough, this was it – the garage sockets worked!!! I don’t think I've been more excited since – although I did have to quickly clean up the mess in the bathroom before I told my wife. It saved $99 ($100 for the call minus $1 for the Lysol and paper towels). 1. Yes, this is the worst game-preview yet. It's really just a glorified boast about home repair. If Purdue doesn't bring home the cannon, I'm going to probably break something. 2. I'm late to watch the Alabama - Oregon State game before the Boilers take on Villanova, so that's why I'm cutting this short. I couldn't be more excited to see Purdue at Madison Square Garden. The Boilers head to the Big Apple this week to take on Villanova in the 2K Sports Classic. 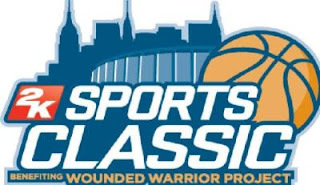 I love these early season tournaments because they feature some fun match-ups you'd never see otherwise (enjoyed watching Duke beat Kentucky and Michigan State take down Kansas tonight). 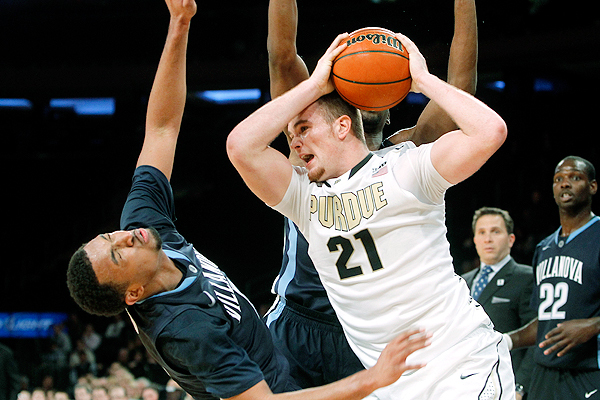 Overall, there seem to be a lot in common between Purdue and Villanova. Both teams feature a lot of young players yet have decent size that allows for different lineups. Last season, Villanova had a rough go of it, with only 13 wins, which include a mere four in conference play, and they lost two leading scorers, similar to the Boilers. This early in the year, each team has a lot of inconsistency as players are trying to define their roles and freshmen adjust to the college game. I expect it to be a close battle and not necessarily a pretty game. Why Purdue Will Win - Because I flipped a coin and heads came up. Villanova can get into problems with their turnovers, so if Purdue can get over the spectacle of MSG and not make stupid mistakes, they have a shot. It'll take strong leadership from Terone and DJ to overcome the freshmen jitters, and Purdue's slate of big men will have to play strong interior defense and win the rebound battle. 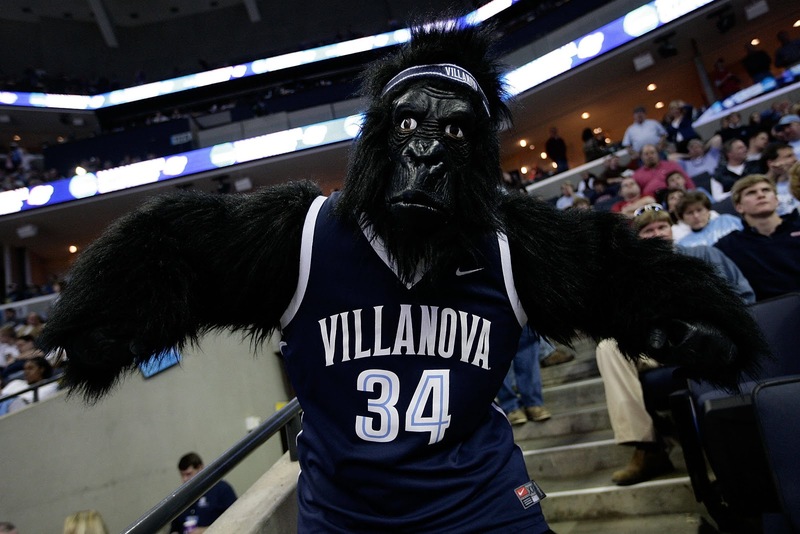 Why Villanova Will Win - Because I flipped a coin and tails came up. Villanova does a good job getting to the basket and drawing contact. They make those fouls hurt their opponent even more by shooting a high percentage from the line. 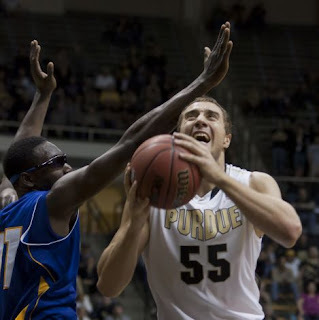 Purdue has the athleticism to keep up with the Wildcats, but the traditional Boiler defense hasn't been as beastly as years past. Villanova is more used to this environment and is playing closer to home, so if they can limit their turnovers and continue to attack, then it could be a long night for Painter and crew. 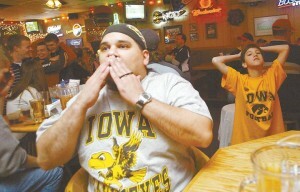 One thing you absolutely need to know before the game - Look for yours truly going crazy in the stands during the game. I'm quite excited to be in New York for some work events that happened to coincide with Thursday's game. Unfortunately I won't be going to Friday's game, but seeing the Boilers at Madison Square Garden is going to be lots of fun. I'm interested to see how many Purdue fans turn out, since tickets weren't very expensive and Villanova has a significant home crowd advantage. With only two games left, the rankings are getting a little easier, but there's still the chance for upheaval at the top. I told you there'd be two great games featuring sequential teams in the rankings, and they certainly didn't disappoint. #2 played #3 with a close result in a hard-fought game, and the game featuring #4 vs. #5 went to overtime. Of course I'm in a much cheerier mood this week thanks to Purdue's victory on the road in Iowa coupled with Indiana's crushing defeat to Wisconsin at home. The Buckeyes had a bye week, but obviously remain undefeated and the top team in the conference. Odds of that changing in the next two weeks? Higher than you may think. OSU still has to face Wisconsin on the road and Michigan at home. If they lose both and Michigan wins out, it could shake things up. Thanks to convincing wins over Nebraska and Penn State, that leapfrog won't happen. Last week I wrote about how Nebraska just keeps winning games after coming from behind. Taylor Martinez is the king of the fourth quarter. The Huskers beat Penn State thanks to 26 second-half points. The division title is theirs to lose with easily winnable games against Minnesota and Iowa left on the schedule. I think a Nebraska/Wisconsin title game will be a fun one to watch, but I doubt the Cornholes will have to come from behind in that one..
Michigan also had to come from behind to force overtime where they topped Northwestern. I don't think they'll catch Nebraska, especially without Denard Robinson. Penn State had the lead but froze up against Nebraska. While I was watching this game, I thought the negated Penn State touchdown was a fumble when I watched in real time. After watching the replay, I wasn't so sure, and because of that, I felt the call on the field should stand. 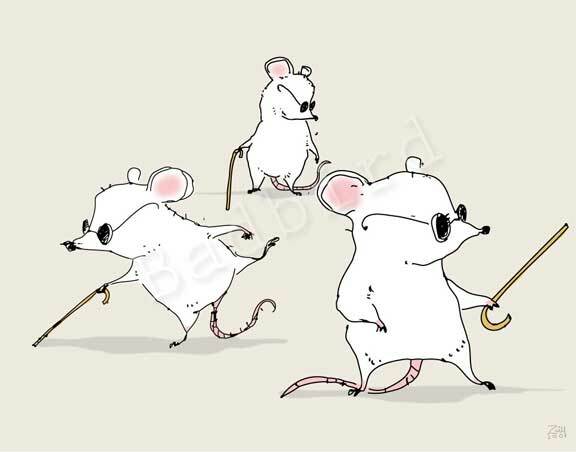 But even though the Lions got hosed, they still crapped the bed the rest of the game as McGloin made a stupid mistake to get flagged for a safety (no doubt about that being the correct call) and they couldn't stop Nebraska on defense. There is absolutely no conspiracy, there was just a very questionable call, and the fact that Penn State fans are acting like the world is out to get them is ridiculous and shows their priorities are still a bit unbalanced. Even with their huge win against Indiana (564 rushing yards!) I still have trouble ranking Wisconsin this high since they haven't beaten anyone good. The Badgers real test will be against Penn State and Ohio State in their final two games. They can prove me wrong by winning one of them, but we may see a 4-4 conference team in the title game and headed to a marquis bowl game with a 7-6 overall record. The Wildcats lost a heartbreaker to Michigan in overtime, but it just fit their theme for the season: beat the bad teams, but lose narrowly to the good ones. They've lost to Michigan in OT, Nebraska by one point, and Penn State by eleven points. Even with their pretty record, this season is a case of what could have been. Fortunately they'll still get one more win against Illinois, but their game next week at Michigan State is how a toss-up. Sparty had their bye week and need to beat Northwestern or Minnesota to get bowl eligible. They're currently in last place in the Legends division, which no one predicted prior to the season. What a disappointment. Minnesota did their Big Ten duty and beat the horrible Illini, and in the process became bowl eligible. This is a big deal since the Gophers finish against Nebraska and Michigan State, both games they will probably lose. Eureka! With winnable games against Illinois and Indiana, there's still hope for a bowl game. Of course, the Boilers could very easily lose both those games, but here's hoping Hope goes out on a high note. It feels good to laugh at IU football again, and to laugh at all the annoying people in Indianapolis that thought the conference title game would feature the Hoosiers. They were exposed horribly as Wisconsin racked up 564 yards rushing. The badgers only had to throw the ball seven times, a tactic the Boilers should note. Can't wait for the Bucket game, and hopefully IU will be even more abused by Penn State in the meantime. The Hawkeyes out-Purdued the Boilers and now must beat Michigan and Nebraska to get bowl-eligible. That's not happening. 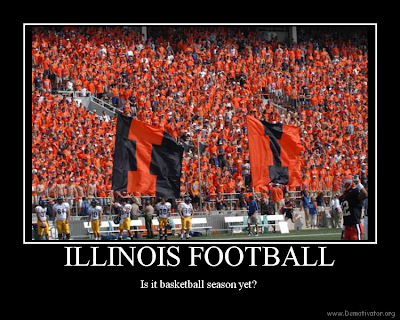 Another loss, but at least Illini fans can enjoy basketball season now! Oh wait, nevermind. 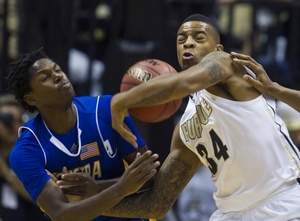 After dropping the first game of the season to Bucknell, the Boilers made easy work of a very poor Hofstra squad yesterday. Honestly, I think we learned more about the team in the Montevallo exhibition game, because Hofstra simply couldn't compete (which we should have known when they lost by 29 points to Monmouth in their opener). A 42-17 first half lead is always a good thing! 77% from the charity stripe. I'd take that in a heartbeat from this team. Anthony Johnson is starting the year out strong. Through two games, little AJ has had 22 points, ten assists, and nine rebounds, with only two turnovers. He's becoming a do-everything guard much to my surprise. Welcome back Terone. The Boilers sure could have used him in the loss to Bucknell, but it looks like his ankle isn't in horrible shape, although it may have slowed him down on defense. We need him healthy if Purdue hopes to make any noise this season. Sandi scored appropriately against smaller opponents, going 5 of 8 for 11 points, as did Jacob Lawson with an offensive explosion for eight points on 4 of 5 shooting. Only four blocks against a smaller, over-matched Hofstra team that had seven swats. We need to see some better defense from the bigs. 20 personal fouls. See my comment above about sloppy play. What's most concerning isn't only the sheer number but that it wasn't just the young freshman. Ronnie had three, but so did Terone and Carroll. The only reason no one was in foul trouble was that everyone got to play significant minutes in the blowout win. Shooting 39% from three-point range. This isn't horrible and I expect it to be a weakness of the team that will prove costly against good competition. The worst thing was DJ Byrd, who should be our best 3-point threat, was only 1 of 4 (3 of 11 on the year) and only Anthony Johnson did any real damage from downtown (3 of 5). 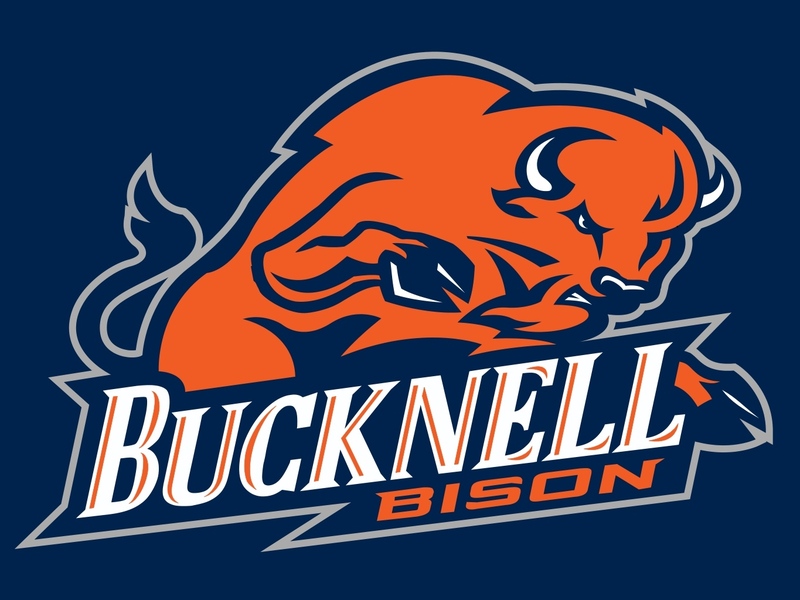 Against Bucknell the three-point shooting was horrible (2 of 16) and a big reason for the loss, so while this is an improvement, it was against a bad team with a lot of open looks. Jay Simpson was 1 of 4 shooting and still out of shape. Hopefully as the season progresses he can be more of a force as he recovers from his off-season issues. Who's happy that we can actually watch the next few games on television! I hope the Big Ten Digital Network is put to pasture by next season, but I'm guessing we'll see even more games broadcast on that revenue stream in the future. Also, don't get too comfortable with your TV, as the Boilers will be featured on "ESPN 3" (i.e. your laptop) later in December. I am officially 0 for 4 this season, and I've bet my maximum four times. If this lasts for six more weeks it will be impossible for me to net a positive result on the season, and I think Erik already has the victory secured. So instead, it is now my goal to get the largest negative score possible. Yes, my bets will be the opposite of a winning bet, but watch, I'll probably do better betting the opposite of what I think will happen. That's a 206 point lead Erik, enjoy it and bar me from ever going to Vegas again.